I know next to nothing about my family tree.Â If I try real hard and do some digging, I could go back maybe five or six generations.Â But I already know what I’d find.Â Some doctors and lawyers, then farmers in America, then farmers in Belgium, Norway, and all over Europe.Â Then there would be craftsmen, then serfs, then vicious Germanic tribesmen and Vikings, and then some apes.Â But if there were something interesting in the back story, or if I had become something amazing based on where my family had come from, then that would be a tale worth finding out.Â This is a look at a situation just like that. 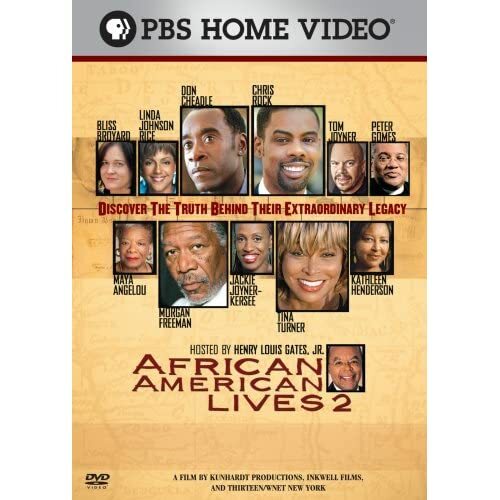 Starting this May 6th, now available on DVD from PBS Home Video and Paramount Pictures is the latest look into the ancestry of some notable African Americans from Henry Louis Gates, Junior.Â African American Lives 2 is ready to be brought home and seen any time you would want to.Â Take a second look at one of the most compelling television specials in recent PBS history. Henry Louis Gates, Jr. is back in his role of hosting the only show on television which takes famous African-Americans on an amazing trip back through their heritage.Â This is done through genealogical investigation and DNA analysis.Â The first episode is â€œThe Road Home.â€Â In this episode, we see stories of the participants’ ancestors in the early 20th century.Â The second episode is â€œA Way Out Of No Way.â€Â In this episode, we delve deeper into their ancestry from the previous episode back through the Civil War.Â The third episode is â€œWe Come From People.â€Â In this episode, we finally get to see their ancestors in their first years here in America.Â The fourth episode is â€œThe Past Is Another Country.â€Â In this episode, through DNA analysis, we learn some fascinating information about the lineage of the participants’ families.Â The notable people looked at in this sequel include Maya Angelou, Bliss Boyard, Don Cheadle, Morgan Freeman, Peter Gomes, Kathleen Henderson, Linda Johnson Rice, Tom Joyner, Jackie Joyner-Kersee, Chris Rock and Tina Turner. As far as special features on this PBS Home Video DVD go, it is presented in a widescreen format and has major corporate funding from The Coca Cola Company, Johnson & Johnson, and Buick.Â There are not any real special features on this DVD, but it’s impressive nonetheless. Although you might not immediately suspect it, mainly because it’s on PBS, this is an incredibly moving and emotional series.Â Gates does a wonderful job as a host for a topic like this.Â Taking a deeper look at history and the personal stories inside of it are always interesting, but when it comes to addressing our shameful history of slavery, that is where this series shines.Â The idea that someones’ ancestor could come here in the hold of ship, be sold and work their lives away for someone else, and that they could go on to become famous and make their own life in that country of former slaves.Â This show is another step forward in dealing with that painful legacy. These Lives are an incredible look at where some of America has come from and how far they have made it. No user commented in " Movie Review: African American Lives 2 "